New Beginnings’ Safe Parking Program provides case management and outreach to the homeless and safe overnight parking to individuals and families living in their vehicles. New Beginnings has operated the Safe Parking Program since 2004 in cooperation with numerous local churches, governmental and non-profit agencies and businesses. We provide confidential, daily-monitored parking places for those who are living in their vehicles because they do not have sufficient income to provide for their basic need of affordable housing. The program currently manages 133 spaces in 24 parking lots throughout the cities of Santa Barbara and Goleta, and the neighboring unincorporated areas of the county. Each of these lots has entered in a written agreement with New Beginnings Counseling Center who has indemnified them against any liability. Since the program’s inception in 2004, there have been no major incidents or damage to any of the participating lots or neighborhoods. The Safe Parking program also connects the chronically homeless to shelters and services that will get them off the streets and into safer environments. Program staff distribute more than 450 pounds of food each month and offer a rapid re-housing component that provides case management to transition program participants into permanent housing and employment. Through the program, New Beginnings offers job tutoring, resume preparation and facilitates outside agency connections as needed to help participants gain employment or obtain government benefits. On a case-by-case basis, New Beginnings writes grants on behalf of clients to help them obtain cash assistance to pay for medical and dental expenses, and other costly, but life-changing assistance. Current proof of valid driver’s license, vehicle registration, and insurance is required. 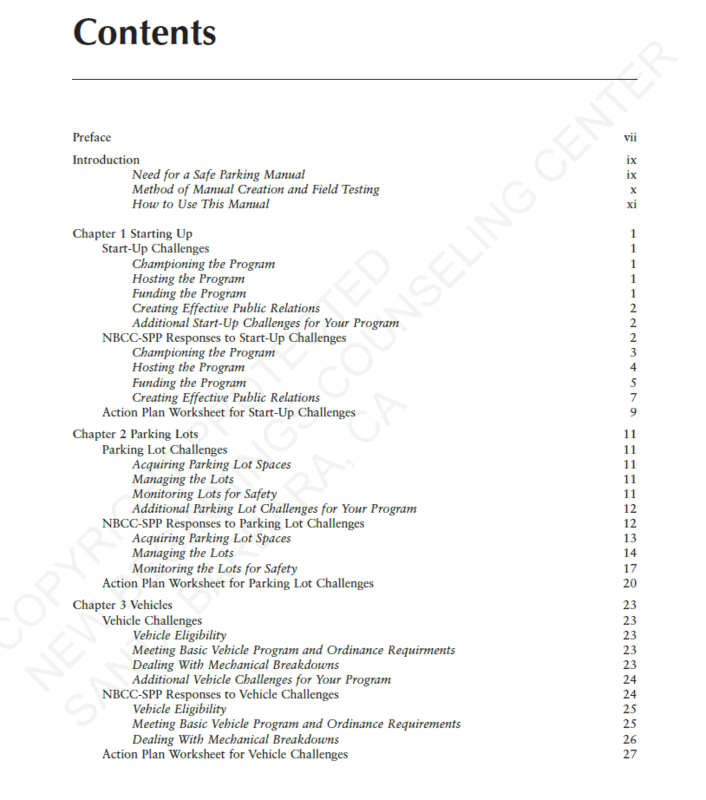 The Safe Parking Program Manual is a guide created for other communities seeking to begin their own program to assist the vehicular homeless. The manual outlines best practices, challenges and how to overcome them, tips and “pearls of wisdom”, etc. 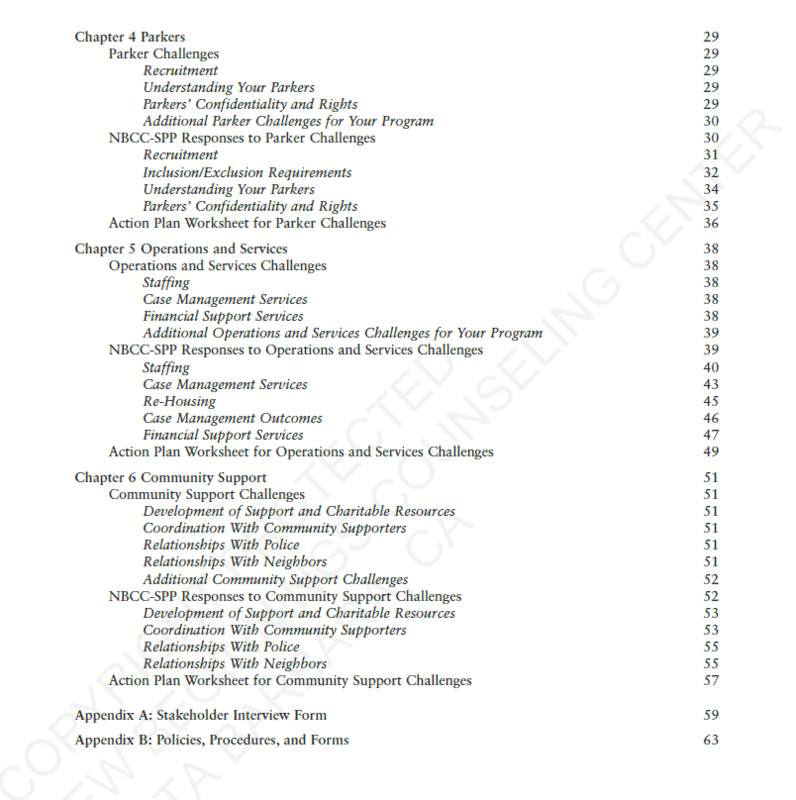 Please see the Table of Contents below for more information.